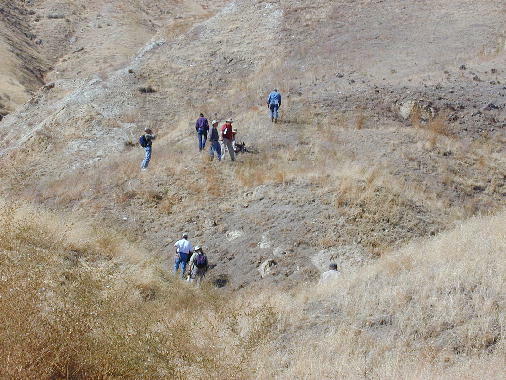 On October 29, 2005, Dr. Mel Erskine led fellow NCGS members on a field trip to examine rare cold seep-nourished biogenic carbonate outcrops on the east margin of the Central Coast Range. 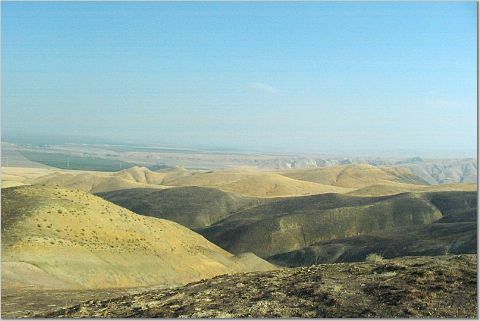 The Panoche Hills Paleocene Cold Seeps trip combined tectonic, structural, and marine geological evidence to interpret these carbonate outcrops as preserved seafloor fauna. The trip built upon research presented by U.C. Santa Cruz faculty and students Dr. Hilde Schwartz, Dr. J. Casey Moore, James Sample, Daniel Minisini, and Kevin Weberling. The Santa Cruz team provided Field Trip #406 “An Extensive Paleocene Cold Seep System: Clastic Dikes, Carbonates, and Chemosynthetic Communities in the Moreno Formation, Panoche Hills, Western San Joaquin Valley” at the 2005 Joint Meeting of the Cordilleran Section GSA, and the Pacific Sections of SEPM, AAPG, and SEG. Mel supplemented their studies with his own research in the Central Coast Range. 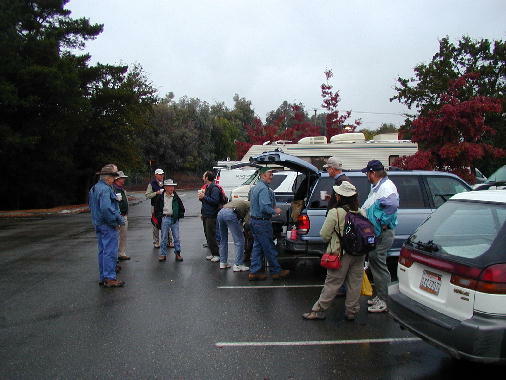 Weather conditions were drizzly and overcast as the group left San Ramon, but improved dramatically when the caravan cleared the Altamont Pass and entered the Central Valley. An hour later the vehicles exited at a vista point near Newman. Here Mel began to discuss various aspects of the regional geology that played a role in the evolution of the cold seeps. 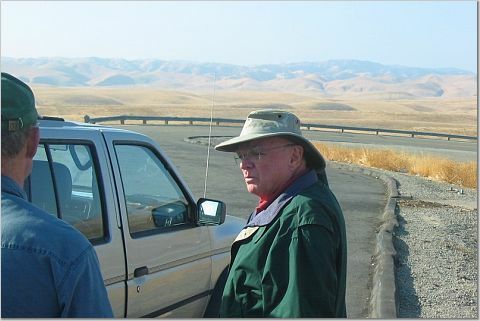 Further south at the Panoche Hills-Firebaugh exit, Mel unfolded his maps and discussed structural relationships associated with biogenic carbonate outcrops exposed in canyons to the west. Mel has had a career as both a petroleum geologist and a geological consultant. 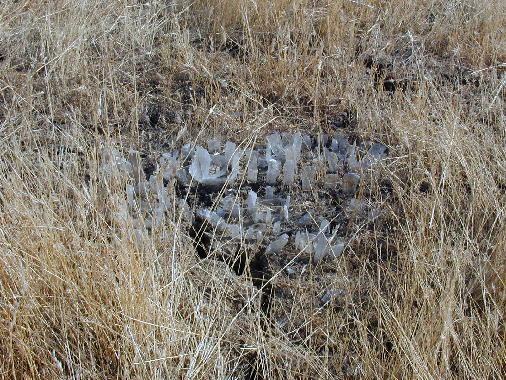 The Panoche Hills cold seep study began as a consulting project. The work initially involved a subsurface mineral rights evaluation. Various structural aspects of the project caught Mel’s interest from his prior experience in the Wyoming thrust belt. His subsurface reconstructions produced some intriguing structural discrepancies that begged for resolution. Mel pursued these problems, and developed some interesting hypotheses that dovetailed with recent interpretations of carbonate lenses in the Cretaceous-Paleocene upper Moreno Formation by the U.C. Santa Cruz team. Mel’s cross sections relied in part on data from a Shell Oil well sunk just south of Pacheco Pass Road. It penetrated basement rock at 16,000 feet. The latter included a 400-foot section of untectonized andesitic volcanics. Mel interprets the latter as a remnant of the Cretaceous Sierran superstructure that sloughed off the batholith as it uplifted. About 10,000 feet of Great Valley and upper Cretaceous sediments were also included in the well core. Repeated sections implied low angle thrust faulting. Mel explained that the Sierra Nevada is an oceanic island arc terrain accreted to the North American continent 100 to 150 million years ago. It resides about 15,000 feet above the brittle-ductile shear zone observed in seismic sections taken across the California Central Valley. The units examined during this field trip are part of an Upper Cretaceous-Lower Tertiary sedimentary basin. The shaly Moreno Formation straddles the K-T boundary and is an onlapping sequence that occurred after thrusting began. Mel noted that the Great Valley sediments are not the same in outcrop as in the subsurface. The former are 20,000 feet thick, whereas only a 10,000-foot section lies on the Sierran basement. These facts must be addressed by structural models of the eastern Diablo Range. Profound evidence of extensive subsurface overpressure in this region was supplied by detailed (1 inch = 20 feet) sketch maps compiled by state Department of Water Resources geologists during construction of the California Aqueduct. Excavations clearly show massive fragmentation and rotation of Kreyenhagen shale blocks encapsulated by Eocene Domengine sands. Structural relationships associated with southwest-vergent low angle ramp faults and the Stockton Arch to the north is thought to have produced Domengine hydrostatic pressures that exceeded the lithostatic strength of the overlying Kreyenhagen shale. 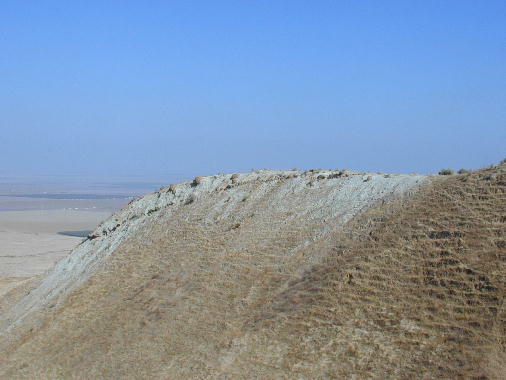 The fluidized sands were subsequently injected into the shattered shaly sediments. Mel’s experience with fluid overpressure systems goes back to his earlier work in the Wyoming thrust belt. This region was a proving ground for the thrust model introduced by M. King Hubbert and William Rubey in their classic 1959 papers on “The Role of Fluid Pressure in the Mechanics of Thrust Faulting.” They invoked fluid overpressure as a means of lubricating regional low angle thrust faults to reduce frictional drag, and allow the upper thrust plate to “slide” over the footwall. Hubbert and Rubey’s model provided a mechanism for explaining substantial displacements observed along many major thrust systems. Fluid overpressure is often found in tectonically active regions, and is frequently encountered in oil fields. Overpressure in the California Coast Range and in the Great Valley has been addressed by F.A.F. Berry in his paper “High Fluid Potentials in the California Coast Ranges and Their Tectonic Significance,” AAPG Bulletin, V. 57, No. 7. Mel’s northeast to southwest cross sections in the Panoche Hills area required a ramp thrust fault system to explain the repeated sections in the Shell Oil core. Outcrops of fossil overpressure zones are rare, and literature describing these occurrences is equally scarce. Ironically, the Central Diablo Range contains at least three chronologically discreet overpressure systems. Mel recognized the existence of these fossil fluid overpressure zones more than a decade ago when he led a 1992 NCGS field trip to outcrops exposed along the California Aqueduct near Garzas Creek. He believes that compaction dewatering of thick shale sequences overlying well-sorted sandstones provided the pressure hydraulics for the submarine seeps that cultivated seafloor biological communities. 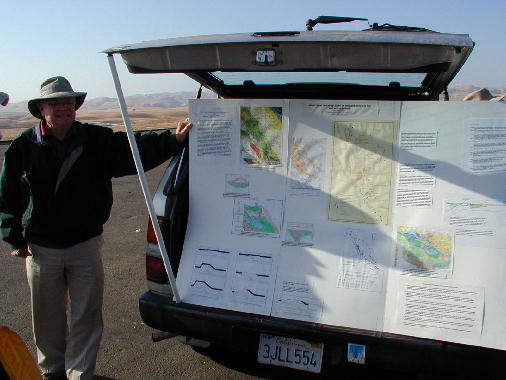 Mel’s principal contributions to the fossil cold seep model was his recognition of regional low angle ramp thrusting along the Coast Range front as a probable overpressure mechanism, and invoking seismic activity on the thrust system to destabilize the shale units trapping the overpressured Panoche sands. 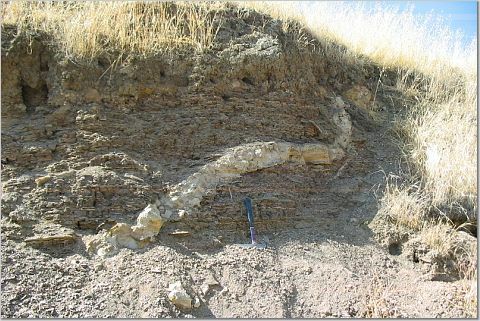 A three-mile trip westward up Esparto Canyon positioned trip participants in tilted Cretaceous-Tertiary sediments containing a fossil fluid overpressure cold seep system and the seafloor communities that it supported. 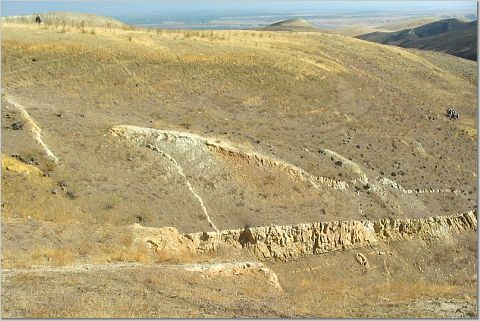 Here arroyos have carved into a sandstone feeder dike network that emanates from the upper Cretaceous Panoche Formation, penetrates the shaly Moreno Formation, and terminates at the conformable sandstone lentil capping Cannonball Ridge. The cold seep sequence exposed here functioned for about 200,000 years. 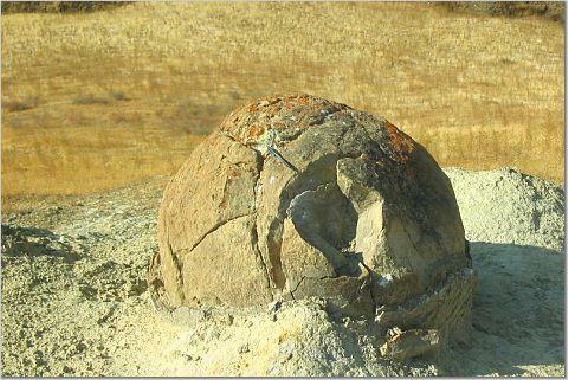 The Pleistocene Tulare Formation, which contains an apparent Corcoran clay equivalent correlated with the ~730,000 year-old Bishop Tuff eruptive event, is exposed in the Panoche Hills. It is flat-lying on hill crests, but to the east it dips 15º to 40º into the Central Valley. This continuous structural transition can be interpreted as a ramp thrust system that was reactivated in post-Tulare time. 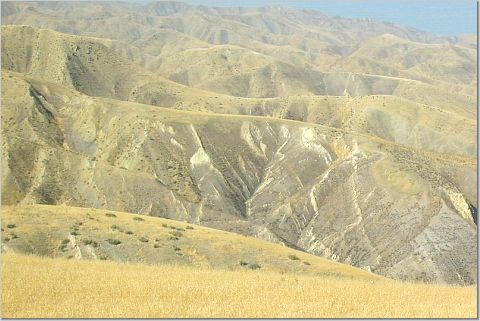 The horizontal ridge-top Tulare sediments located eight miles east of the Diablo Range front indicate the Range has advanced 8 miles since at least the Bishop Tuff eruption. Further north near the Livermore Valley, Tulare equivalent Livermore Gravels have been overthrust by Cretaceous sediments, again attesting to recent thrusting activity in the Central Coast Range. 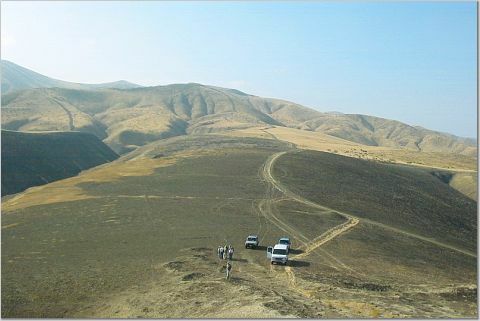 Uplift in the Panoche Hills area is consistent with periodic movement along a basal thrust plane 5000 feet beneath the surface. Numerous sedimentary regressions recorded by unconformities in the stratigraphic column reflect periods of active thrusting. The New Idria anticline and Vallecitos syncline to the west are part of this structural system and are on trend with a blind thrust in the Coalinga area that triggered an 11 km-deep M6.7 earthquake in 1983. Mel suspects recurring seismicity along the ramp-run (inclined) section of the thrust fault during periods of tectonic activity destabilized the overpressured sandstones and created new seeps. The low angle ramp thrust system is attributed to northwestward underthrusting and uplift as transpressional forces between the Pacific and North American plates push the Coast Range into the Central Valley. Mel peripherally noted that the Ortigalita Fault in this area is considered the “Coast Range Thrust” or Great Valley Fault, which facilitated gravity sliding of sedimentary units off the uplifting Diablo Range. Descending into nearby arroyos, the group examined the 200 meter-thick sandstone dike and sill system feeding biological communities in the overlying Moreno Formation. 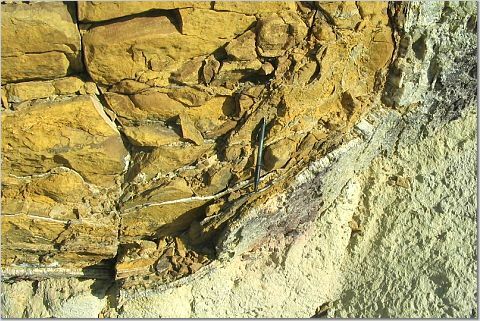 The dikes and sills penetrated thin-bedded shales cross-cut by gypsum (CaSO4·H2O) seams. The Panoche-Moreno sequence represents a short-term progression from shallow water sandstones to deepwater shales. The gullies clearly revealed the feeder dikes for the overlying cold seep carbonate biological communities. The sandstone dike “plumbing” evolved over about one quarter million years in response to recurring destabilizing seismic events. The tectonically overpressured sandstones ruptured and intruded the consolidated shales, and eventually communicated with the seafloor. As connate pore fluids leaked out of the Panoche sandstones, dissolved sulfur supported a Paleocene anaerobic fauna similar to those discovered in today’s offshore Monterey Bay submarine canyon. The latter are nourished by pore fluids escaping from submerged outcrops. The analogy between these modern day communities and the fossil outcrops in the Moreno Formation is striking. The U.C. Santa Cruz research team led by Drs. 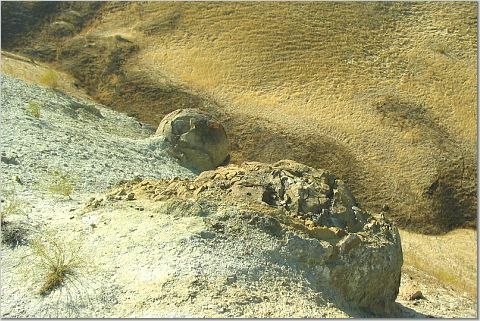 Hilde Schwartz and J. Casey Moore spent over 5 years characterizing the biocarbonates exposed on Cannonball Ridge before they announced their findings. Incorporating Mel Erskine’s seismically-active, episodic ramp thrusting model for injecting overpressured sandstone dikes into the shaly Moreno Formation provides a coherent cause and effect model for the Cannonball Ridge cold seeps. After lunch, Mel took everyone to a hill looking eastward toward Cannonball Ridge. Across a steep-sided arroyo sandstone feeder dikes could be seen terminating at the carbonate layer beneath the hill crest. The hilltop is a discontinuous series of carbonate mounds and pavements fed by cold seep vents. 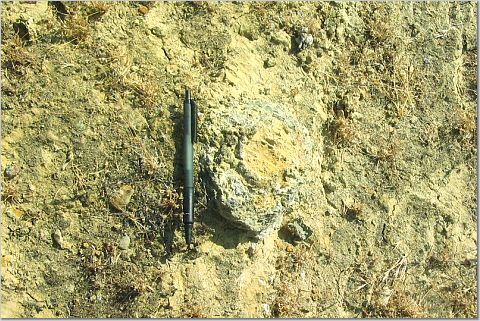 Gypsum-mantled carbonate concretions are scattered throughout the interbedded shale-carbonate horizons. Massive carbonate mounds are comprised of undisturbed bivalve and tube worm assemblages in life positions. Several densely-packed tube worm vent communities crop out on the steep westward-facing Cannonball Ridge slope. The members dispersed to closely examine carbonates exposed along the ridge crest. Mel noted that fluid overpressure sandstone dikes and carbonates are sparsely scattered throughout the Dos Palos member of the Moreno Formation. None of these features occurs in the overlying Paleocene Lodo Formation. Looking eastward from the Cannonball Ridge sandstone lentil, Mel pointed out the approximate location of the Cretaceous-Tertiary boundary, slightly above the contact between the Marca and Dos Palos members of the Moreno Formation, and stratigraphically below the sandstone lentil. 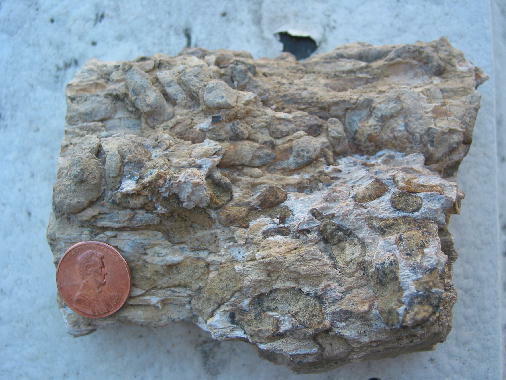 This 1 cm-thick conformable horizon contains glauconite (a clay mineral formed under reducing conditions) and phosphate debris (fish bones and small shark teeth). 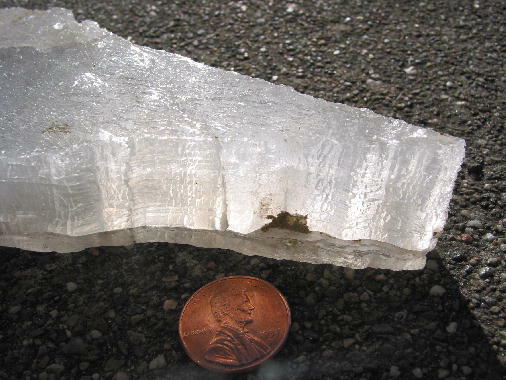 Elsewhere this layer is marked by altered glass spherules. No iridium-enrichment (considered a geochemical indicator of a meteorite impact that allegedly led to mass extinctions) has been found in this zone. 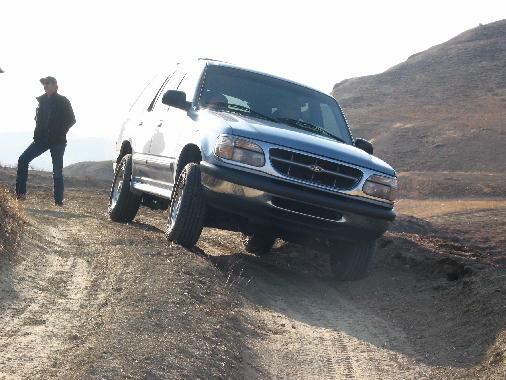 The group made a final stop on the edge of a steep canyon south of Cannonball Ridge that exposed numerous sandstone dikes in the Moreno shales. 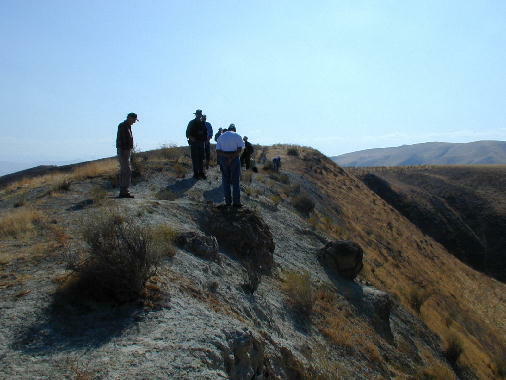 The Panoche Hills field trip provided a unique opportunity to explore rare outcrop exposures of what has been interpreted as an ancient seafloor cold seep fauna. The latter closely resembles modern day biogenic carbonate communities living on sulfur and methane-bearing cold seeps/vents in Monterey Canyon. 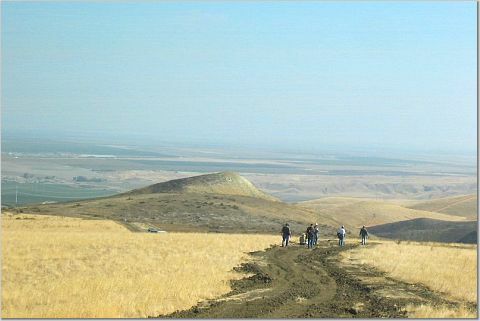 The field area is one of several sites exposed in a 20 km long belt in the Panoche and Tumey Hills. The trip offered additional input from leader Mel Erskine that tied the paleo-cold seep genesis to tectonically-driven fluid overpressure zones in the underlying Panoche sandstone/shale complex. The latter is thought to be associated with a periodically-reactivated low-angle ramp thrust system involving structures from the Coalinga blind thrust to the New Idria antiform. Sandstone dike and sill intrusions that fed the cold seeps are thought to be triggered by discreet seismic events on the ramp thrust system. The NCGS sincerely appreciates the efforts of Mel Erskine and Tridib Guha to arrange the Panoche Hills Field Trip. Tridib handled the registration, food, beverages, transportation, and logistics. Several members provided personal vehicles for transporting people to the field sites. 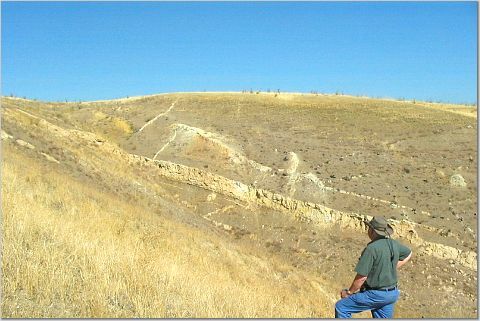 The writer would like to personally thank NCGS member John Christian for making available an April, 2004 Peninsula Geological Society Panoche Hills field trip guidebook and a 2003 Geo-Marine Letters professional article, both authored by the U.C. Santa Cruz researchers, which helped to prepare this summary.